Their image struck on a tintype. From this moment on this image truthfully preserved. 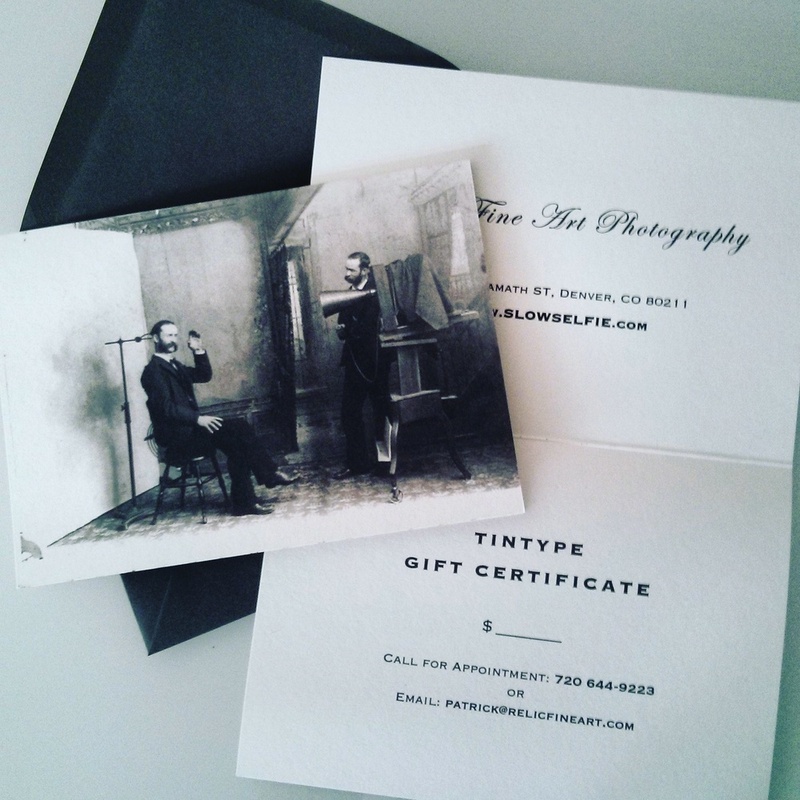 10th Anniversary Tintype! Came out super, crisp natural pose .. plus bonus new age retro aura hugging the edge. Unbreakable bond these two. Results coming soon! Scene from "The Dark Valley"
Recently and by total coincidence, I've come across two movies on Netflix that have 19th century processes featured in them. Most notably, was a movie titled, "The Dark Valley". Curiously enough it's an Austrian-German Western film set in the Alps and includes some very striking scenes of the daguerreotype process. In the beginning scenes of the movie a lone horseman rides into a dark, cold town under the guise of a photographer. Scene from "The Dark Valley" Sam Riley's character riding into town complete with daguerreotype gear packed up on a second horse. In one of the opening scenes a group of awestruck townspeople look on during a daguerreotype portrait session. The thing about this scene is that it is still common for people to gather during the making of a 19th century style photograph. Curiosity continues to reign supreme. Scene from "The Dark Valley" Townspeople looking on during a portrait session of man holding his gun on the left. Scene from "The Dark Valley" Over the shoulder of the sitter showing the star of the movie Sam Riley as the photographer. This was one of my favorite scenes as it portrays the experience of sitting for a portrait very well. Complete with a metronome, which I absolutely love as a method for counting the seconds of exposure for the photograph, adding an amazing additional layer of intensity to the scene and experience of the process. Scene from "The Dark Valley" The sitter. I love the hand painted background in this photo and of course the tense pose. There is only one person I know of who commissions hand painted backgrounds but I've lost his contact info. They pop up on Ebay from time to time. A mountain scene would be something I would love to incorporate into my offerings at the studio. Something I will keep on my Ebay radar or perhaps a local painter may want to exchange services . . . Scene from "The Dark Valley" Another portrait session scene. Behind the scenes of "The Dark Valley"
I loved this behind the scenes photo as well showing Sam Riley peering into the daguerreotype camera with the movie camera lens attached to the other end. The directors captured this scene exquisitely. Here is a resulting still from the scene of Riley peering into the ground glass of the rear of the dag camera. Scene from "The Dark Valley" Riley making a landscape photograph. The second movie I watched recently on Netflix was "Cold Mountain". This movie has been around for awhile, since 2003, but that is the beauty of Netflix! In this film tintypes play a very romantic role between the two main characters played by Jude Law and Nicole Kidman. The film is set during the eve of the American Civil War. Both characters are are shown full of excitement to have their tintypes taken as afterwards each of them exchange with the other, their tintypes to remember one another as Law goes off to fight in the war. The American Civil War occurred during the height of the tintype era so the incorporation of tintypes into the film fit perfectly. During one scene Law's character is seen in a trench battle on the front lines when he scrambles to find his beloved tintype photograph. In another Kidman's character is seen looking intently at her tintype image of Law. American Civil War battle scene from "Cold Mountain"
Both characters in the film are are shown full of excitement to have their tintypes taken as afterwards each of them exchange with the other, their tintypes to remember one another as Law goes off to fight in the war. The American Civil War occurred during the height of the tintype era so the incorporation of tintypes into the film fit perfectly. During one scene Law's character is seen in a trench battle on the front lines when he scrambles to find his beloved tintype photograph. In another Kidman's character is seen looking intently at her tintype image of Law. Tintype of Nicole Kidman as her character of Ada Monroe from the film "Cold Mountain"
Tintype of Jude Law as his character of W. P. Inman from the film "Cold Mountain"
For me the fact that the couple held their tintypes so dearly close to hearts reinforced my romance with the craft of making images. Throughout my photography career whether it be film, digital or tintype imagery I have truly enjoyed the moment of capturing every frame. However the process of tintype photography intensifies this feeling as both the sitter and the photographer have more of a vested experience with the making of the photograph. I suppose it's still true today that if one's home is about to burn to the ground, what do you rescue? In this modern day perhaps it's more often a hard drive of images but it seems, curiously, much more romantic to be sweeping up a handful of tintypes from the mantel. Image from the set of "Cold Mountain" More characters from the film shown in a "Tinprint"